Homeland star Claire Danes covers the October issue of Harper’s Bazaar UK looking lovely in a leather Prada dress. The actress – who is mom to nearly 2-year-old son Cyrus – gets real about motherhood and her hubby, fellow actor Hugh Dancy. For more from Claire, go to Harper’s Bazaar UK…. Mom-of-two Kate Hudson covers the October issue of Red and opens up about body image and family life with fiancé Matt Bellamy and sons Ryder, 10, and Bing, 3. Yes, Brad Pitt and Angelina Jolie turned over much of the planning for their Aug. 23 wedding to their six children – including the cake and even the dress. But when it came to making things official, they tapped someone rather more experienced. Their officiant of choice: retired California judge John Ouderkirk, who presided over the Aug. 23 non-denominational civil ceremony at the family’s French estate, Châeau Miraval. The judge currently handles conflict-resolution cases for private firms. But he made headlines in 1993 while presiding over the hot-button trial of two black men accused of trying to murder white truck driver Reginald Denny during 1992’s riots in South-Central Los Angeles. A former Marine and Santa Monica, California, police officer, Ouderkirk oversaw the ceremony, while Jolie, 39, and Pitt, 50, had previously secured a marriage license in California. The judge was one of only 20 attendees at the ultra-intimate affair, along with Brad’s parents, Bill and Jane, his siblings, Doug and Julie, and Jolie’s brother, James Haven. 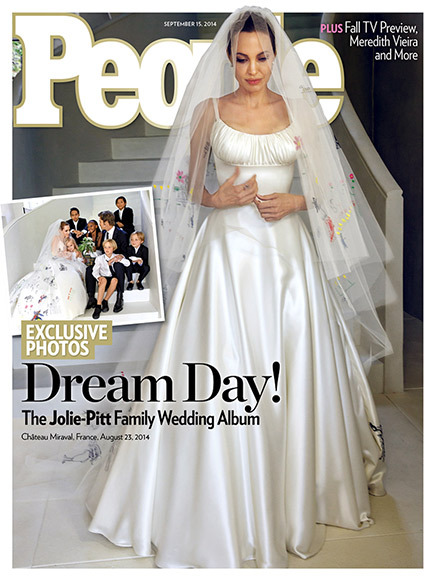 For Brad and Angelina’s complete wedding album, all the details of their big day and more of the couple’s interview, pick up this week’s issue of PEOPLE, on newsstands Wednesday. It’s a match made in Jersey Shore heaven. Jenni “JWoww” Farley‘s daughter and Nicole “Snooki” Polizzi’s son are off to a great start in becoming BFFs like their mommies. The reality star and fiancé Roger Mathews welcomed their first child in July, but both moms are adamant there’s no romantic future for their fist-pumpers in training. “I feel like it would be weird if they hooked up or started dating,” Polizzi, 26, told PEOPLE in February. Hopefully three isn’t a crowd: Polizzi is pregnant with her second child, a girl.